A brief primer on the ongoing UN climate talks, as delegates meet in Lima. The period from 1989 was as significant for global environmental politics as it was for world politics more generally. The shift to discussion of global issues no doubt reflected the mood of the waning bipolar Cold War era and the aspirations of a new global capitalist governance which followed the toppling of the Berlin wall and the collapse of the USSR. However, the timing also reflected the mounting scientific evidence of adverse industrial impacts on planetary systems. The discovery of the ‘hole’ in the ozone layer in 1985 was critical here. An international conference was convened for 1987 in Montréal. There, a protocol was agreed to phase out ozone-depleting gases. The Montréal Protocol entered into force in 1989. This was lightening speed in diplomatic time, and seemed to many to herald a new era of evidence-based international co-operation. This was the context in which the question of global warming entered the world stage. The now-famous ‘greenhouse effect’ had been known as a theoretical possibility since the works of Fourier, Tyndall, and Arrhenius in the 19th century, but had only become an observed contemporary trend from the 1980s. The then NASA scientist, now full-time climate activist James Hansen was prominent in making the somewhat arcane meteorological data into a political issue, most famously in his testimony to congress in 1988. So following on from the success of the Montreal Protocol in protecting the ozone layer, global warming became the next big issue in global environmental governance. At the United Nations Conference on Environment and Development (UNCED) “Earth Summit” in Rio de Janeiro in 1992, the United Nations Framework Convention on Climate Change (UNFCCC) was agreed, and entered into force in March 1994. The theory was the convention would provide a framework under which subsequent protocols could be negotiated. These negotiations were to take place at annual ‘Conferences of the Parties’ or COPs, the first of these, COP-1, was held in Berlin in 1995. 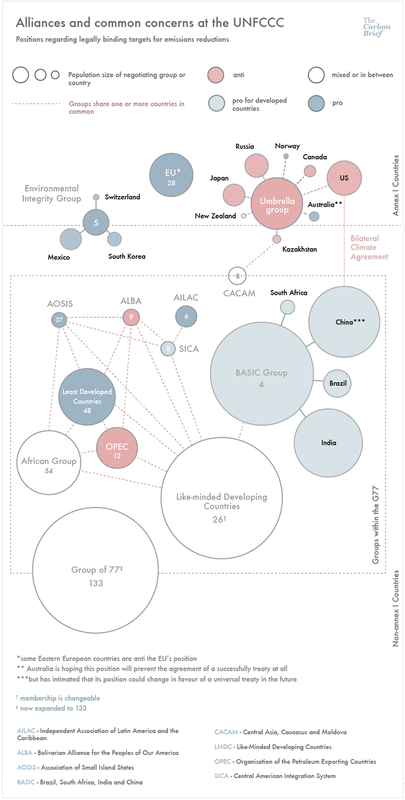 According to one analyst, “the UNFCCC reflects a carefully balanced compromise (…) Many of its provisions do not attempt to resolve differences so much as paper them over.”1 Indeed, it quickly became apparent that the conflicts of interest were orders of magnitude greater than they had been with the ozone layer. CFC gases were used in relatively few industrial processes, most notably as aerosols and refrigerants, and adequate substitutes were readily available. Fossil fuels on the other hand were not only lucrative businesses in their own right, but entire economies had developed strong path-dependency on cheap fossil energy. Negotiations under the UNFCCC lead, in 1997, to the Kyoto Protocol, which remains the only international agreement which has imposed legally binding limits on greenhouse gas (GHG) emissions. The Protocol was adopted in December 1997 in Kyoto, Japan, but did not enter force until February 2005 when the signature of Russia met the threshold requirement. The Protocol divides countries into industrialised (Annex I parties) and non-industrialised/industrialising countries (non-Annex I parties), with the former agreeing to binding GHG emissions reductions averaging 5% against a 1990 baseline for the five-year ‘commitment period’ 2008-2012. The non-Annex I parties included the rapidly industrialising states like China and India. The protocol itself was only agreed after late-night extended talks and the personal intervention of then US vice-president Al Gore. The price for US agreement was the specification of market “flexibility mechanisms” within the text of the treaty: Joint Implementation (JI), the Clean Development Mechanism (CDM) and Emissions Trading (ET). There is not room for a full critique here,2 but suffice to say these mechanisms have been implicated in numerous land-grabs and enclosures, the creation of new financial instruments, and various outright scams and double-counting tricks, without even meeting the modest goals of the protocol. This failure was in-part inscribed at inception. Prior to the Kyoto talks, the US Senate had passed the ‘Byrd-Hagel resolution’ 95-0, stating that the US should not sign up to any binding commitments without non-Annex parties making comparable commitments, or which “would result in serious harm to the economy”. Consequently, the US signed the treaty but it was never passed to the Senate. Having forced the focus on market mechanisms, the US never ratified the protocol, and formally withdrew in 2001. However, any attempt to blame the US would miss the wider structural problem with intergovernmental environmentalism: expecting states to voluntarily co-operate to curtail lucrative sectors of their economies. The protocol required 55 states to ratify it to enter into force. This happened in 2008 with the signature of Russia. However, Russia’s economy had collapsed with the end of the USSR, and had barely recovered. Given the close coupling of GHG emissions to economic activity, this meant Russia had already met its protocol commitment to emissions reductions on a 1990 baseline. The result was to introduce a large amount of ‘hot air’ into the system in the form of surplus emissions credits, further weakening the already flawed market mechanisms which required scarcity even to work in theory. Copenhagen had been widely hyped as the ‘last chance’ talks. When they failed, Kyoto expired without replacement. Now, the COP-21 talks in Paris 2015 are being billed as the new last chance. However, in the near two decades since the Kyoto Protocol was negotiated, global emissions have continued to rise, interrupted only by a one-year blip in 2008 during the global economic crisis. Consequently, the scale of the emissions cuts required has grown dramatically. Kyoto mark-II isn’t going to cut it. Ahead of the COP-20 talks in Lima, 2014, the US and China announced a bilateral agreement to reduce their emissions. However, the cuts involved are still well short of those required to have any chance of keeping global mean temperature rises below 2oC. Even the World Bank - hardly radical critics of capitalism - have said as much. Consequently, it seems vanishingly unlikely that the COP talks will yield anything substantially beyond Kyoto, if a new agreement is even reached at all. The material interests involved are just too great. Emissions cuts of the scale now required will only come if sufficient pressure from below can be placed to overcome the material interests which oppose change. Whether this is achieved by a new compromise between labour and capital or through a genuine process of communisation remains an open question. In either respect, however, technocratic governance processes and international summits will not be able to impose the necessary changes by themselves. Fortunately, the post-Copenhagen climate movement seems to have lost some of its belief in politicians, and a number of direct action struggles on the ground have emerged to block fossil fuel extraction. Attempts to develop unconventional fossil fuels via fracking have been blockaded from Elsipogtog to the Sussex village of Balcome. Not to mention the large-scale resistance to the transcontinental Keystone XL pipeline planned to pump crude oil from the Alberta tar sands in Canada to the refineries and port facilities in the Southern US. CDM - Clean Development Mechanism, one of the three market-based “flexibility mechanisms” of the 1997 Kyoto Protocol. See also Emissions Trading (ET) and Joint Implementation (JI). CFCs - Chloroflurocarbons, ozone-depleting gases phased out under the 1987 Montreal Protocol. COP - Conference of the Parties to the UNFCCC. ET - Emissions Trading, one of the three market-based “flexibility mechanisms” of the 1997 Kyoto Protocol. See also the Clean Development Mechanism (CDM) and Joint Implementation (JI). JI - Joint Implementation, one of the three market-based “flexibility mechanisms” of the 1997 Kyoto Protocol. See also the Clean Development Mechanism (CDM) and Emissions Trading (ET). UNFCCC - United Nations Framework Convention on Climate Change, usually said ‘UNF-triple-C’. 1. Bodansky, D. (2001) 'The history of the global climate change regime', in Luterbacher, U. and Sprinz, D. (ed.) International relations and global climate change, London: MIT Press. Page 34. 2. Though there is not space for a full critique in this short primer, we intend to address some of these approaches in detail in future articles. Copenhagen 2009 had been widely hyped as the ‘last chance’ talks. When they failed, Kyoto expired without replacement. Now, the COP-21 talks in Paris 2015 are being billed as the new last chance.